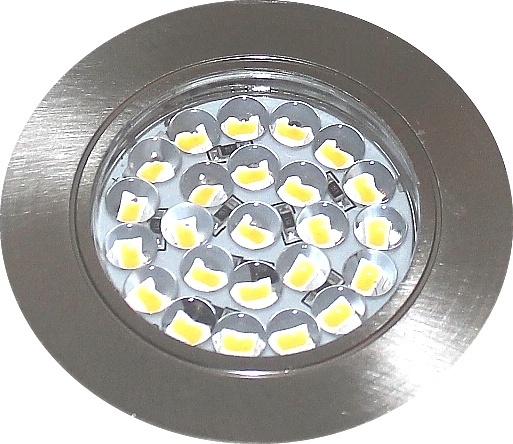 LED recessed downlight for furnitures equipped with SMD LED 1.5 watt, 2700 k warm white 120lm. 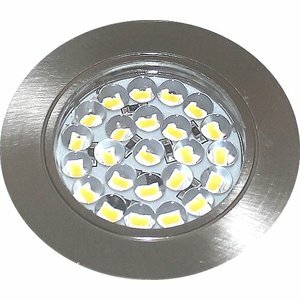 Flat LED recessed downlight suitable as kitchen cabinet lighting. Available as a complete set. This cabinet led lighting is equipped with 2 meters of led cable with LED mini plug. From the drop-down menu you can choose a loose led recessed lights or as a complete set with all the connection materials not dimmable led driver, distribution box and cable with euro plug. Ready for installation! possibly dimmable with Wireless LED dimmer unit. For the loose LED recessed cabinet lights you can use a LED driver 12 volt dc (equivalent power), there are dimmable and non dimmable LED drivers available. Please note the minimum and maximum load of the led drivers.